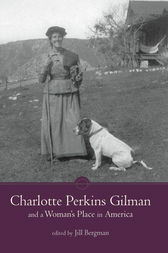 Charlotte Perkins Gilman and a Woman’s Place in America is a pioneering collection that probes how depictions of space, confinement, and liberation establish both the difficulty and necessity of female empowerment. Turning Victorian notions of propriety and a woman’s place on its ear, this finely crafted essay collection studies Gilman’s writings and the manner in which they push back against societal norms and reject male-dominated confines of space. The contributors present fascinating and innovative readings of some of Gilman’s most significant works. By examining the settings in “The Yellow Wallpaper” and Herland, for example, the volume analyzes Gilman’s construction of place, her representations of male dominance and female subjugation, and her analysis of the rules and obligations that women feel in conforming to their assigned place: the home. Additionally, this volume delineates female resistance to this conformity. Contributors highlight how Gilman’s narrators often choose resistance over obedient captivity, breaking free of the spaces imposed upon them in order to seek or create their own habitats. Through biographical interpretations of Gilman’s work that focus on the author’s own renouncement of her “natural” role of wife and mother, contributors trace her relocation to the American West in an attempt to appropriate the masculinized spaces of work and social organization. Engaging, well-researched, and deftly written, the essays in this collection will appeal to scholars of Gilman, literature, and gender issues alike. Jill Bergman is the author of The Motherless Child in the Novels of Pauline Hopkins and a coeditor of Our Sisters’ Keepers: Nineteenth-Century Benevolence Literature by American Women. She is a professor emerita at the University of Montana, where she taught courses in American literature and women’s studies. Her work on American women writers has appeared in numerous journals and collections.